Are you ready for one more slice of turkey? Some films are better left unknown. You have “classics” like Manos: The Hands of Fate that cross the line into the “so bad it’s good” territory. Then, you have those films that never cross the line. They just stay in the bad territory, leaving cinemaniacs wondering what the hell were they thinking. 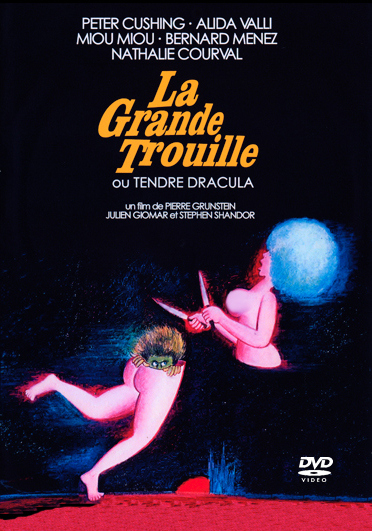 Such is the case with Tender Dracula (1974). 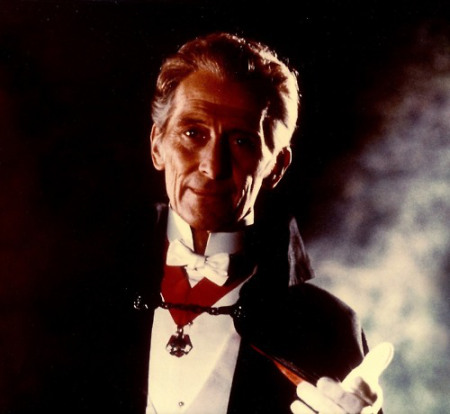 The initial thought of Peter Cushing playing a vampire is interesting. After so many Hammer films playing Van Helsing and fighting off the evil Count Dracula, it would be kind of cool to see him on the other side, right? Well, theoretically, the answer is yes. However, when all we get for our desires is a mess like Tender Dracula, the question is better off never being answered. The plot is simple enough. Cushing plays actor MacGregor, best known for his work on a TV series as a vampire (think Barnabas Collins). Now, after countless episodes, he has decided to switch gears and go into romantic efforts. A producer sends two writers and their girlfriends to Macgregor’s home/castle in an effort to convince him to stay with the horror role. However, is it possible that MacGregor is really a vampire? As the tale unfolds, it becomes more and more likely that he is indeed a creature of the night. I really have no idea what caused Cushing to agree to do this film. Maybe it was the chance to play something different. Maybe it was just a desire to continue to work as it is well-known that he never really recovered after the loss of his wife. However, surely even he regretted the decision to do this film once he made it to the set. The film rambles on for some 90 minutes with endless talking, odd musical numbers, poor acting and a general lack of common sense. Cushing plays MacGregor so over-the-top that it becomes laughable at times. Now, this was intended to be a comedy of sorts but it is never really funny. This one was a real struggle to make it through. Is there anything redeemable in the movie? Well, you do have Cushing but even he isn’t enough to save this movie. This French film has never been commercially released in the United States and, honestly, I doubt it ever will. You can find it on YouTube for free, which is how I recommend you go. The print appears to be a VHS dub off a faded 16mm print, which adds to the overall experience (or lack thereof). If you love Cushing, see it once to say you did and then move on. Then, pull one of the Cushing Hammer classics off the shelf to cleanse your palate. Was this a turkey? Indeed, it was the whole damn bird. With that, let me wish all of you and yours a very Happy Thanksgiving! With Christmas inching its way ever closer, there will indeed be the 3rd Annual Countdown to Christmas next month. Some horror flicks, some really odd entries that will leave you with nightmares and more Scrooge to add to our previous year’s reviews of the timeless A Christmas Carol story. Until then, it’s time to go watch some good movies. In October, I celebrated the greatness that was and still is Boris Karloff. Over the course of more than 31 days, I revisited a ton of Karloff flicks and relished every minute of it. However, we’re now in the middle of the Countdown to Turkey Day and all that was great in October is in the past. All we have this month are scraps. There will be plenty of more Karloff classics in 2015 but first, let’s get something out of the way. November 23, 2014, would have been Karloff’s 127th birthday. So, in honor of the day, let’s take a look at The Island Monster (1954). Karloff loved to work and he was willing to do almost anything as long as it either looked promising or had something unique to offer. But sometimes, all it took was the possibility for him and his wife to enjoy a vacation for him to take a film role. Such is the case with The Island Monster. In the early 1950s, Karloff was starring in such television series as Suspense and Tales of Tomorrow as well as accepting the occasional film role. His horror flick renaissance hadn’t yet happened, so the choices were not as plentiful as they once were. 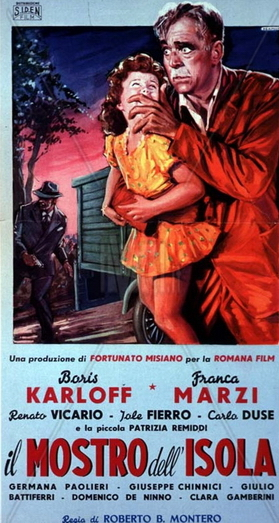 So, with the opportunity to visit Italy, Karloff jumped at the chance to star in what initially seemed liked a fun little Italian crime flick. It would turn out to be one of his worst on-set experiences. The Island Monster was filmed on Ischia, a little island off the coast of Napoli. Karloff quickly became frustrated at being the only English-speaking actor on set. It left him isolated and confused, not that easy to accomplish considering the script about drug smugglers didn’t make any sense. And no, there is no monster in the movie. 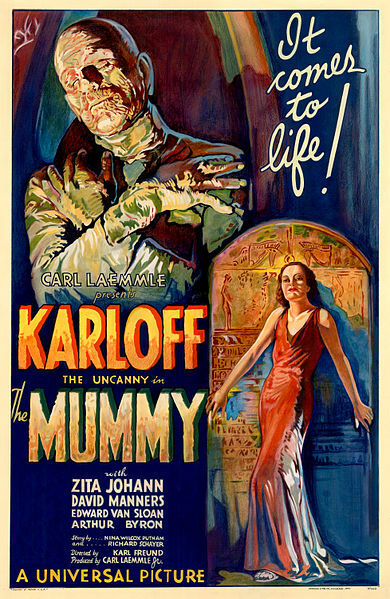 The title was an obvious attempt to capitalize on Karloff’s horror background. Oh, there is a child kidnapping but that’s about as close as we get to anything terrorizing. Well, that’s not entirely accurate. How boring and poorly filmed this flick is can be quite scary. When production wrapped, director Roberto Montero (63 films to his credit and no titles anyone will recognize) struggled with what to do with the film. Unfortunately, it would get worse. The worst part about The Island Monster is the dubbing. 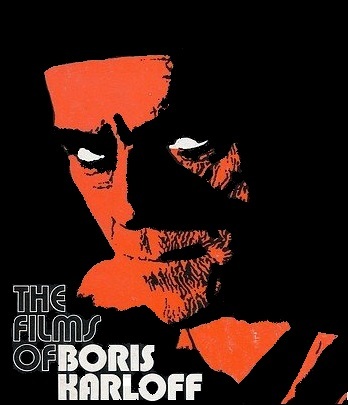 Oh sure, you see Boris Karloff but you never get to hear him. What you hear in the dubbed version is an English-speaking actor doing his worst Karloff impression and I do mean bad. Why did they not take the time and effort to have Karloff read his lines? The end result is quite annoying and, for me, it was a key factor in my overall displeasure with this film. That said, did Karloff enjoy his vacation? Apparently not as the usually ever-pleasant Karloff was at almost constant odds with a very unpleasant hotel manager the entire stay. Suffice to say, a lousy experience for one and all. The Island Monster is in the public domain and pops up from time-to-time on various box sets. There is a DVD release with Chamber of Fear (1968) but save yourself a few bucks and just watch it on YouTube for free. I’m not even sure I can recommend this one to anyone other than the most die-hard Karloff fans. We have just enough time for one more slice of really bad turkey. Come back on Wednesday as we see the legendary Peter Cushing slumming around in the dreadful Tender Dracula (1974). 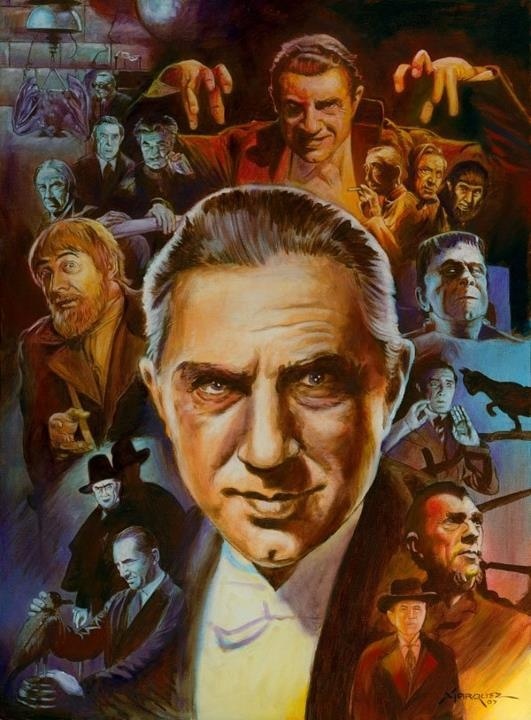 By 1952, Bela Lugosi’s career was nearing an end due to his continually declining health as well as Hollywood’s lack of interest in the one-time headliner. He had just completed work in the latest Arthur Lucan Old Mother Riley film, Old Mother Riley Meets the Vampire. 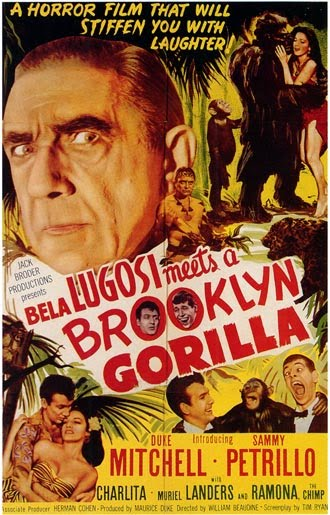 With few options and his addictions in full swing, Lugosi would next star in a film that, while not necessarily his worst film, it would certainly be ranked very near the bottom…Bela Lugosi Meets a Brooklyn Gorilla (1952). Our story begins with nightclub act Duke Mitchell and Sammy Petrillo getting stranded on an island known as Kola Kola. 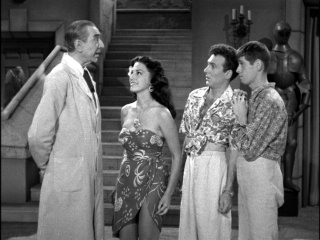 While the local natives are friendly, there is a mysterious scientist named Dr. Zabor (Bela Lugosi) who is sure to cause trouble. It seems Duke has fallen in love with the tribal chief’s daughter Nona (Charlita). However, Dr. Zabor loves her too and the jealous doctor has plans to turn Duke into a gorilla so he can win Nona’s heart. On the surface, Bela Lugosi Meets a Brooklyn Gorilla isn’t a terrible film. It has a fairly acceptable plot and the acting isn’t horrible from most of the cast. Bela Lugosi, looking worn and tired, turns in a fairly pedestrian performance as a mad doctor. However, Lugosi has done worse so his part is acceptable too. The truly painful part of the film centers on the lead actors, Duke Mitchell and Sammy Petrillo. They are clearly doing their best to play like Dean Martin and Jerry Lewis. In fact, it is these performances that lead to the more interesting back story of the film. Sammy Petrillo had stumbled into a career by looking and acting like Jerry Lewis. Jerry Lewis briefly used Sammy Petrillo in some television sketches but Lewis was not happy with Petrillos’ act. Promises were made to help Petrillo but Lewis clearly felt threatened. Petrillo soon met singer Duke Mitchell and they formed a nightclub act where they would act like Dean Martin and Jerry Lewis along with other interpretations. In 1952, their manager, Maurice Duke, would pitch the idea of the duo hitting Hollywood. The only problem was that, in reality, the duo was horrible. Sammy Petrillo was a fair enough version of Jerry Lewis but Duke Mitchell was no Dean Martin. However, that didn’t stop Realart Pictures owner Jack Broder. With Broder moving ahead on production of Bela Lugosi Meets a Brooklyn Gorilla, word reached Jerry Lewis. As Hollywood legend has it, Lewis and Broder argued over the use of Mitchell and Petrillo in a film. Paramount producer Hal B. Wallis, who had Martin and Lewis under contract, threatened to sue Broder and, despite almost coming to terms, a deal was never reached and the friendship was never rekindled. 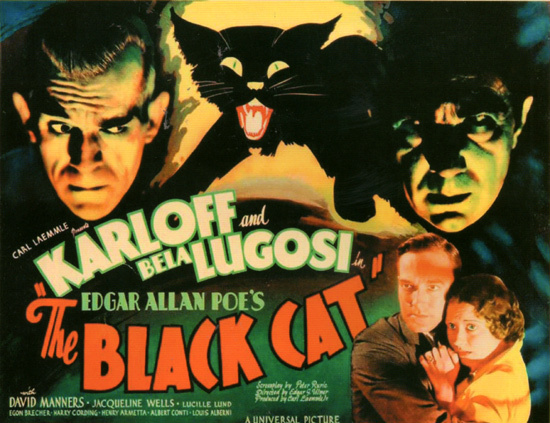 Broder moved ahead with the release, trying to cash in on Bela Lugosi’s role in the film. On an interesting side note, Mitchell and Petrillo continued their act despite being blackballed by the jealous Jerry Lewis. In 1956, when Martin and Lewis split, so did Mitchell and Petrillo. Bela Lugosi Meets a Brooklyn Gorilla is the public domain and the print I watched was very good. Oddly enough, it doesn’t pop up too often on the usual public domain box sets. It’s worth a watch as Petrillo isn’t too bad in small doses and Lugosi is okay, but it is sad to see how far he had fallen. The worst part is the Mark of the Vampire (1935) ending and Duke Mitchell’s painfully bad singing. I mean really, really bad singing. The movie is on YouTube but the prints aren’t as good as my $1.00 Digiview DVD, so you might want to track that copy down. Consider this one a really good slice of smoked turkey. Still bad but there are worse flicks out there. Most of us have seen a poorly dubbed “children’s” film at one time or another. You know, those kiddie matinees that came from foreign countries and were supposed to entertain us back in the 60s or 70s but were really horror movies in disguise. Sometimes it was true horror while other times it was just nightmare inducing storylines or characters that now leaves the older you wondering what the heck they were thinking when they made that movie. 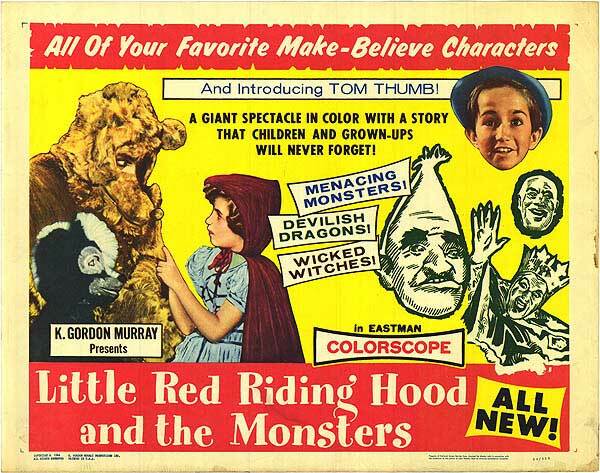 So, ladies and gentlemen of the cinematic jury, may I present Tom Thumb and Little Red Riding Hood vs. The Monsters (1962). Going into this flick, it may be helpful to know that it is actually the third chapter in a trilogy. Not that you need to see the first two films first. It’s just helpful to know that the nightmare was really three times as long. Young actress Maria Garcia played the lead role of Little Red Riding Hood in La Caperucita Roja aka Little Red Riding Hood in 1960. It was in that first film that we see her dog Duke as well as Stinky Skunk, originally a henchman to the Big Bad Wolf. In 1961, she returned in Little Red Riding Hood and Her Three Friends. 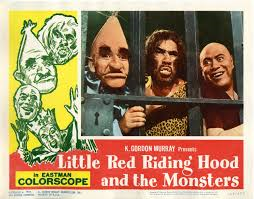 In 1962, the trilogy was wrapped up with Tom Thumb and Little Red Riding Hood. In all three films, Santanon stars as Stinky while Manuel “Loco” Valdes is the Wolf. By the third film, things have clearly gone to the dark side as it turns into the craziest monster fest I’ve personally ever seen. The Wolf and the Ogre are on trial for treason and turning good. The courtroom is full with just about every creature costume they could probably find south of the border. The judge is a vampire and the jury consists of Frankenstein’s monster, a two headed man (one looking like Tor Johnson, the other like a caveman), a creature capable of creating hurricane winds, a pinhead character referred to as Carrot Head and another creep called the Kidnapper. This guy goes on about how he likes kidnapping children because they are tender and make a good broth. Add in a goofy witch and her sister, the Evil Queen (who has stepped right out of Snow White and the Seven Dwarfs) and even the robot from The Robot vs the Aztec Mummy (1958). What follows is a crazy storyline of how the Evil Queen wants Little Red Riding Hood and her new friend, Tom Thumb (Cesareo Quezadas “Pulgarcito”, Santa Claus) dead. The townsfolk are turned into monkeys, Tom’s family are transformed into mice and a good witch (carrying a wand made out of sparklers) helps them on their way to the castle to save the Wolf and the Ogre from being executed. Did I mention the Evil Queen worships Satan and calls upon his services? Or how about how a group of children hang the kidnapper from a tree and turn him into a human piñata? How about monsters being set on fire? Fun for little kids everywhere. Oh yes, let me not forget that there are also several musical numbers. Yes indeed, this movie is warped. The flick had several titles, several including “monsters” to help lure the American audience. It was released in the US under the guidance of K. Gordon Murray, a name very familiar among horror fans for his horrifically dubbed Mexican monster flicks. The original Tom Thumb and Little Red Riding Hood might have made more sense but I somehow doubt it. Indeed, this is a turkey with all the trimmings. So, do I recommend it? Yes, indeed I do as it falls into that “so bad it’s good” category. It was released on home video by Something Weird Video at one time but appears to be out-of-print. However, it is available for free on YouTube, so save yourself the cash and catch it for free. Just don’t say I didn’t warn you! This is not a documentary of the war in Korea but a dramatized study of the effect of war on a group of people. Where dramatic license has been deemed necessary, the authors have taken advantage of this license to dramatize the subject. 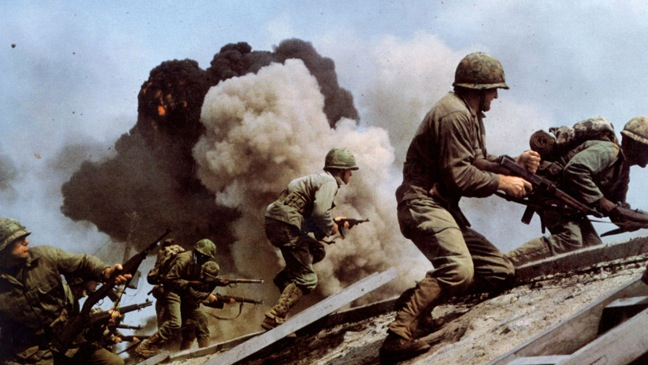 Americans have a fascination with war films. Every year come Memorial Day, Labor Day and Veterans Day, the usual suspects can be found on Turner Classic Movies. Whether it is John Wayne in The Sands of Iwo Jima or Clint Eastwood in Kelly’s Heroes, there is never a lack of good action flicks to choose from. However, there is one particular film that never gets shown on television. In fact, I’m sure many of you have never even heard of it and with good reason. As the part of our month-long Countdown to Turkey Day, let’s bring out the first course of our turkey feast…Inchon (1981). Inchon takes place during the Korean War and centers on the Battle of Inchon, a key conflict that was a turning point in the war. With a budget of $46 million, shooting locations from Italy to Ireland to Japan and South Korea, and a cast that was headlined by Laurence Oliver as General Douglas MacArthur, on the surface the movie appeared to have it all. However, what Inchon failed to have was a good script. The end result was a prime example of how all the money in the world and a star-studded cast cannot save a film that meanders for 2 ½ hours from random scene to random scene. There are essentially four stories that make up Inchon. You have the primary plot in which General MacArthur leads the United States forces into what many called an impossible landing at Inchon. There is Major Frank Hallsworth (Ben Gazzara, Anatomy of a Murder) and Sgt. August Henderson (Richard Roundtree, Shaft), who are on the ground in South Korea and play a part in securing a lighthouse needed to signal the ships to land. Jacqueline Bisset (The Deep) stars as Barbara, the wife of Major Hallsworth, who spends most of the film driving and trying to get a group of orphans to a school and safety. Toshiro Mifune (Seven Samurai) is the father of a woman Major Hallsworth is having an affair with, both of whom ultimately play a key part in the success at Inchon. And then we have the group of reporters headed up by David Janssen (TVs The Fugitive) in his last role as David Feld Park. Along the way, you may even recognize Omar Shariff (Lawrence of Arabia) in a cameo role that clearly wasn’t worth the money he would have been paid. The script for Inchon was a horrid mess written by Robin Moore and Laird Koenig. Random scene changes and a lack of cohesion play a key part in this film’s ultimate failure. Initially, the movie was a bold idea on the horrors of war as told through three different love stories. But, even with a running time of 2 ½ hours, and an obvious need for action, the sub-plots seems to just get in the way. Director Terence Young was the man behind some of the earliest James Bond classics, including From Russia with Love (1963) and Thunderball (1965). This is not his shining moment on film. 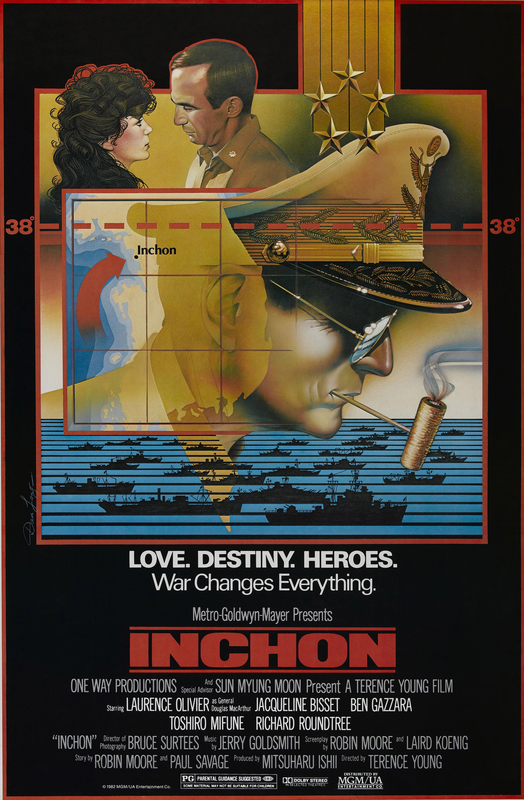 Composer Jerry Goldsmith (Star Trek: The Motion Picture) actually did put together a good score for Inchon. However, it gets lost in the random scene shifts. All of the cast seem to just be going through the motions and trying to make some sense of the plot. Gazzara snoozes his way through the film while talents like Mifune and Shariff are wasted. 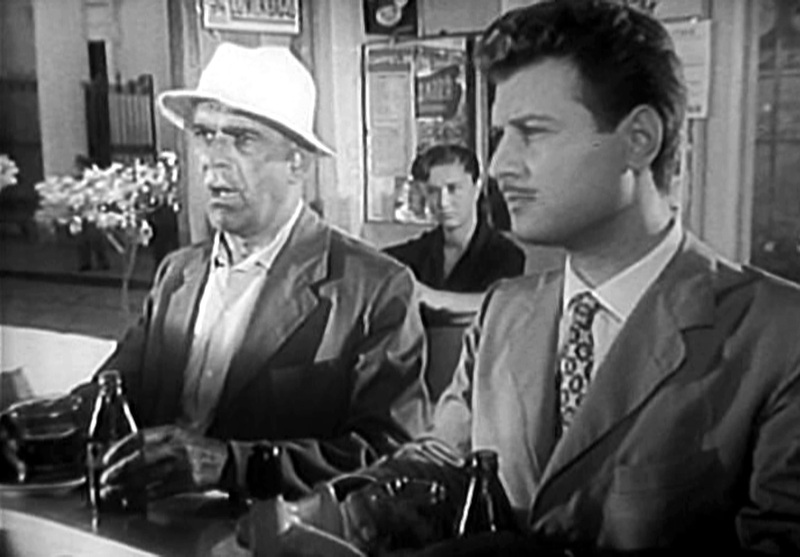 Janssen’s role as the reporter was eventually cut from the film but was present in the version I watched. Somebody forget to tell the reporters to look like the 1950s rather than the 1970s, a rather irritating lack of detail. Laurence Oliver’s poor health plagued production while his makeup left him virtually unrecognizable without making him look like General MacArthur. The odd God references scattered throughout were meant to show some divine intervention in the saving of the South Korean people. It only adds to the thought that movie was ultimately propaganda, another factor leading to its failure. Perhaps the biggest problem with Inchon actually concerns the source of funding behind the film. Toho Pictures was originally involved until they received pressure and dropped out. The controversial Unification Church and the Rev. Moon ultimately funded the film and the odd promotion, which involved psychics claiming MacArthur’s endorsement of the film and supposed images of Jesus Christ appearing on set photos. 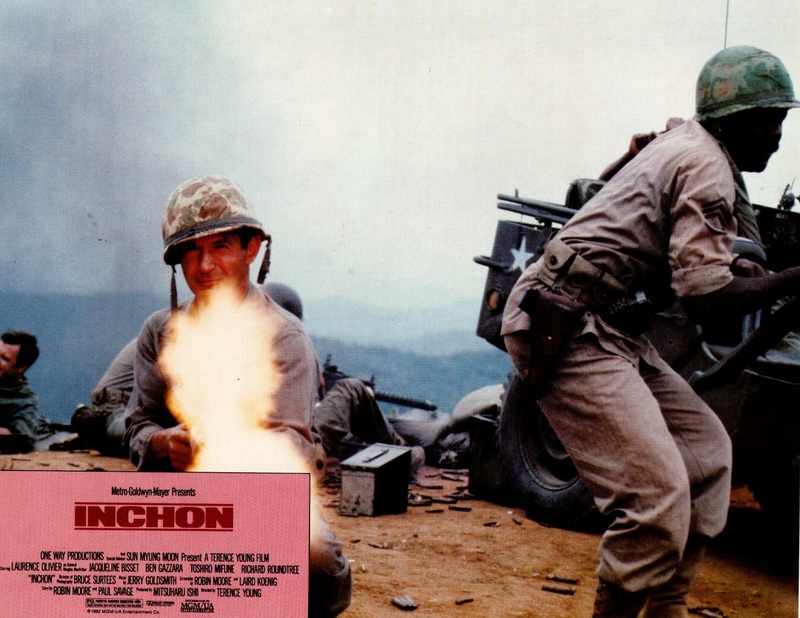 With other problems such as constant reshoots, cardboard cutouts used during battle scenes and the United States Department of Defense pulling their support after discovering the Unification Church’s involvement, Inchon never stood a chance at being profitable. 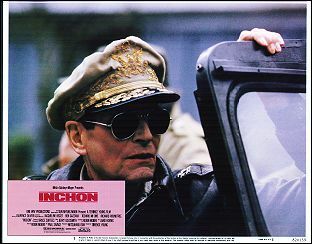 Inchon debuted on May 4, 1981, at the John F. Kennedy Center for the Performing Arts and, eventually, at the Cannes Film Festival in May 1982. A 105-minute version of Inchon was eventually released to theaters in September 1982, coming and going very quickly, soon to be forgotten. Inchon has never been released on home video in any format and, to the best of my knowledge, only played on the Goodlife Television Network sometime around 2000. The network was owned at the time by the Unification Church. Finding a personal copy of this film is going to be near impossible and, when do you stumble across one, it will likely be a bootleg made from this rare television airing. My copy wasn’t very good but enough to see how bad the film really is. Inchon is currently on YouTube and I recommend watching it, not for enjoyment but for a lesson in how all the money in the world does not a good movie make. Stay tuned as we have the worst of the worst from Bela Lugosi, Boris Karloff and Peter Cushing coming up as we near Thanksgiving Day 2014 here in the US! Now that Mr. Karloff is back in the tomb after tasking me for 33 days in a 31 day tribute, there are some loose ends to close out October. Easily, October is the busiest month of the year here at Monster Movie Kid Central. It’s a lot of fun and this year was the best ever, revisiting films I hadn’t seen in over a decade. However, the hangover in November leaves me wanting to take a quick break and mentally recharge, not to mention giving my DVR some much needed love and attention. However, there were three events and two movies last month that definitely need some attention. First and most importantly, the 2014 Free State Comicon happened on Oct. 25. 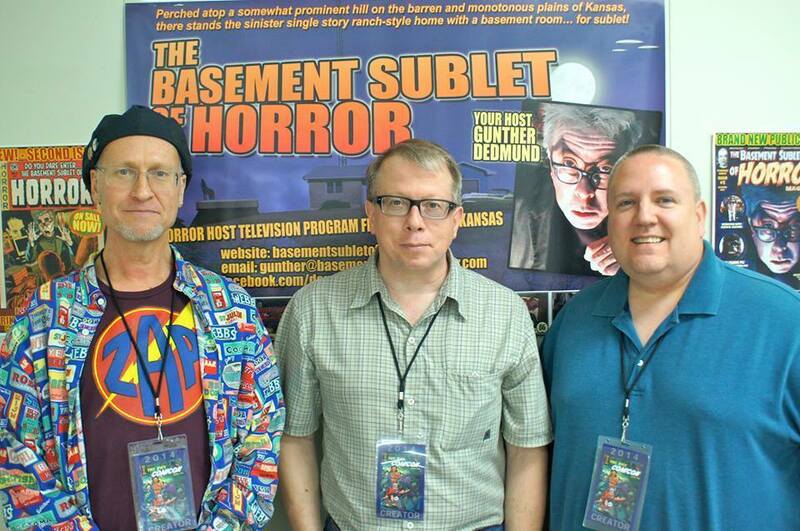 This marked my first appearance as a guest, planned entirely by Mr. Joel Sanderson aka Gunther Dedmund over at the Basement Sublet of Horror. While it was definitely an odd experience being on the other side of the table, I had an incredible day. I had a chance to talk about this blog to both current and new readers. While there are no delusions of grandeur, the fact that people enjoy reading my random ramblings on movies old and new is something that still amazes me. I met several great creators including writer CW Cooke, Darren Neely and Scott Schmidt, not to mention artist Rik Livingston. I ran into some old friends and even had a surprise visit from my daughter Kayla. Great conversations with Rik and Joel topped off a day where I may have spent too much money from several of the great vendors in attendance. Craig Klotz puts on a top-notch event and I cannot recommend his shows enough. I will certainly be attending more in the future with money in hand. And even if I never sit on that side of the table again, it was an experience I never thought possible. Thank you Joel Sanderson and here’s to more great projects ahead in 2015! By the way, be sure to check out his site as the comic book and magazine (with yours truly) are still available and well worth your time. Several years ago I had the chance to watch Nosferatu on the big screen at the Wichita Orpheum Theatre. It was horrible! A less than stellar print with a horrendous soundtrack caused me to walk out mid-way through the film. The Kansas City Symphony made up for that in such a way they may have spoiled any future showings. 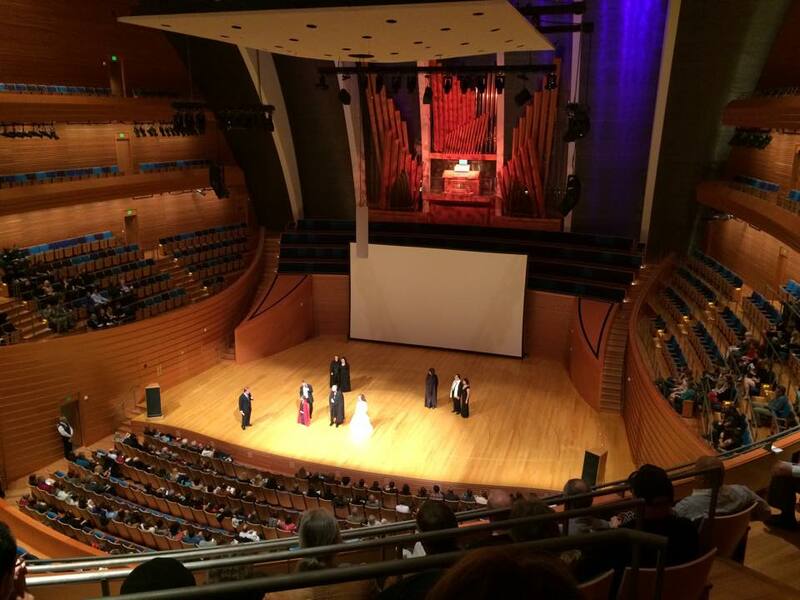 First, the Kauffman Center is amazing with spectacular views of downtown Kansas City. They showed the Kino Lorber Blu-ray print with Grammy award-winning organist Dorothy Papadakos performing an original score. A tremendous experience from beginning to end. This was my first time watching a play screened at a movie theater. Despite some technical issues at first, it was a lot of fun. 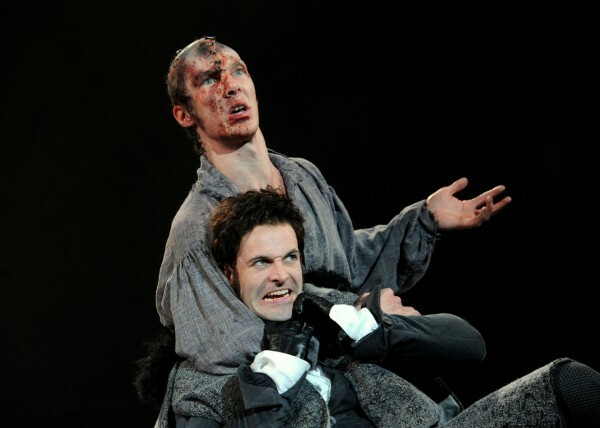 While the performance is about three years old now, it was my first time to see Benedict Cumberbatch as the Monster. He was fantastic and may very well be one of my favorite versions of the Monster. This will likely never be released on home video so if you ever have a chance to see it, I cannot recommend it enough. Mixed reviews aside, I really enjoyed this new take on Dracula. I thought Luke Evans was great in the role and while it was a bit of a CGI fest, the CGI was great. I thought the story was good and it entertained me. I don’t ask for more than that. So, I recommend you check it out when it comes to home video. Definitely deserving more attention that it seems to be getting. 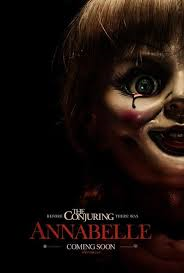 I absolutely loved The Conjuring (2013) so I was initially excited about this prequel. However, I was also skeptical that it could make an entire movie out of what was really a prologue in the first film. Annabelle has some good going for it including setting it in the 70s with genuine creepy moments. However, it does succumb to the temptation of too many jump scares. I liked the somewhat cheesy demon but can understand where others would not. Definitely worth a rental but, ultimately, it seemed a bit forgettable. Fun at the moment but not something you’ll want to revisit again and again. Okay, that’s it. October is finally in the books. Time to slow things down a little as we begin to enter the holiday season. 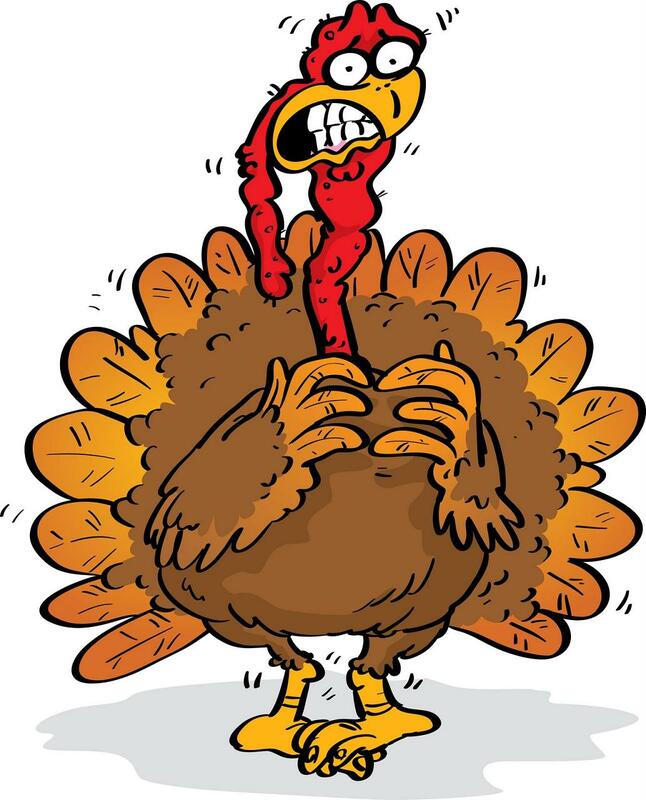 I’ve got some fun articles coming up as the turkey is in the oven and the Countdown to Turkey Day commences next week. And ideas are brewing for what needs to be called the 3rd Annual Countdown to Christmas in December. Until then, as always, thanks for reading and your continued support! So this is the 34th consecutive day of posting an item about Boris Karloff here at Monster Movie Kid. We started with a prelude on September 30th, worked our way through the entire month of October and have arrived on November 2nd. Our journey ends here for now but before we take a look at the future, let’s wrap up a few loose ends. Per request from reader Barry Harding, here are my current top ten favorite Boris Karloff films. As with any list, they will vary depending on my mood but this is what I have as of today. Ask me next week and they’ll likely be different. With that said, the Universal classics are always high on the list. I love Karloff and Peter Lorre together, so no surprise two of their films together are represented. And finally, I have a soft spot for #7 as I vividly remember my dad and I watching this on a Saturday night with Crematia Mortem on the Creature Feature in the early 1980s. And if you are wondering what my least favorite flick is, this one never changes. The Island Monster (1953) is a really bad flick. More on that flick later. As for the better Karloff films, I will continue to review more of his films randomly throughout 2015. There are a lot more great films and why should we bother stopping now. Now, per another request, here is a checklist of what I have already done here at Monster Movie Kid. And last but not least, what is the plan for the 4th Annual 31 Days of Halloween in 2015? This was an easy decision that I made somewhere around Oct. 5th…A Tribute to Bela Lugosi! Same format as this year with a current plan of reviewing 34 films including co-stars such as Boris Karloff, Basil Rathbone and Lon Chaney Jr.
With that, the Monster Movie Kid needs a break. It’s been a fantastic month and I appreciate all of the great support both here on the site as well as on Facebook. I’ll be back later this month with the Countdown to Turkey Day where I’ll be reviewing some real turkeys. 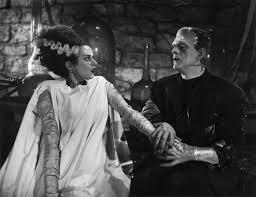 Movies on tap will include The Island Monster (1953) starring Boris Karloff, Bela Lugosi Meets a Brooklyn Gorilla (1952) and a crazy Mexican horror flick involving Tom Thumb, Little Red Riding Hood and a singing Frankenstein. Stay tuned!